Replaces AP 180 with 28% more capacity. 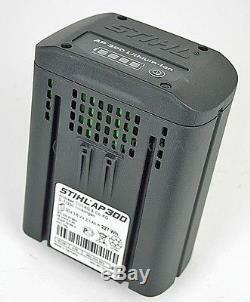 Stihl AP 300 Lithium-Ion battery for all Battery engines. Very strong effect Lithium-Ion battery a voltage of 36 V and an output of 227 Wh. Running time is dependent on the machine. Equipped with state of charge indicator (LED) and suit barns AL 100, AL 300 and AL 500th Technical data Weight of battery kg 1.7 Voltage V 36 Charging voltage V 42 Battery Cell Technology LITHIUM-ION Energy Wh 227 Capacity ah 6 Battery Energy Wh / Ah 216 Battery life BGA 85 min 30 Battery life FSA 65 min 90 Battery life FSA 85 min 45 Battery life HLA 65 min 180 Battery life HSA 66 min 180 Battery life HSA 86 min 180 Battery life MSA 160 C-BQ min 52 Battery life MSA 200 C-BQ min 45 Battery life with ASA 85 min 600 Battery life with HLA 85 min 180 Battery life with the TSA 230 min 20 Deviations in the assortment may occur in accordance. The item "Stihl AP300 Battery Lithium Ion Pro" is in sale since Thursday, December 15, 2016. This item is in the category "Business, Office & Industrial\Power Tools\Batteries & Chargers". The seller is "kc-hire-1990" and is located in Newry. This item can be shipped to United Kingdom.